The first record I remember buying with my own money was Mechanical Animals by Marilyn Manson. When I was a kid I had an older cousin who was into a lot of alternative music, and he was really into Marilyn Manson. He had a Marilyn Manson poster on his wall that absolutely shocked me, and I literally bought the album off the back of how he looked: that androgynous figure with the prothetic breasts. When I got the album home, I hid it from my parents because I thought if they found out about it it’d be really bad. So if felt like my own little secret in a way. That was the precious thing about it, and I think that’s something that’s maybe lost in music today, how personal buying physical music can be. I remember buying the album from HMV in Portsmouth and reading the booklet on the train back home. I’d read all the lyrics before I’d even heard a song. Digesting a record was different back then. It was a much more tangible experience. Do you want to join Creeper's fright club? The album immediately appealed to me anyway, and I think I was really lucky to find that record first because I grew up listening to David Bowie with my dad; I knew his music inside out, especially all the glam rock-era Ziggy Stardust stuff, and that Marilyn Manson record was like his glam rock outing. He even looked like David Bowie on the cover because he had one eye contact in, and in all the footage from the live shows around era he used to wear outfits just like David Bowie. The record itself is heavily influenced by Bowie: I Don’t Like the Drugs (But the Drugs Like Me) has a funk part in it that sounds like the Bowie song Fame, and Manson created a fictitious spaceman character for the record called Omega, who’d fallen down to earth, which was obviously very similar to the Ziggy Stardust creation. That mixture of David Bowie and heavier music was a great introduction to alternative rock for me: it was heavy and hard but also dramatic and theatrical, which is the kind of music I’d already grown up with. So it was the perfect crossing point for me to get into heavier music. I actually don’t know whether I would’ve understood heavier music as well had it not been for that record. It was the first record, as well, where he’d stopped working with Trent Reznor, who he’d kind of built his career with. He ditched Trent for that record and Twiggy Ramirez ended up writing most of the songs. After falling in love with the album I went back and found his earlier records, and it was shocking to me how different they were. If you look at the progression between the first record and that one, it’s stark, and that’s something I still think about to this day: how you can progress and shape shift and become something else. Seeing glam rock applied into an alternative world like that really excited me. I suppose Mechanical Animals still influences me now, in that I’m always thinking very aesthetically, and that’s because the first record I bought was such an aesthetic masterpiece. That cover is so iconic and it will go down forever as one of the greatest album covers of all time. I remember seeing it on the shelf and it looked genuinely scary. I’m not sure if we have that so much these days. Then you have the way he presented himself on stage, and how he became something completely different to the way he was on the other records. That’s something we’re really interested in doing in Creeper. We’ve made three EPs so far and each one is significantly different to the last. I think that kind of derives from being a kid and listening to Mechanical Animals, and seeing and hearing the influence of my dad’s music in that. 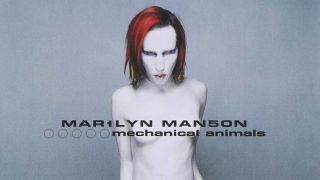 Marilyn Manson was almost like my David Bowie, I suppose, and Mechanical Animals is still a very special record to me. Creeper’s The Stranger is out now through Roadrunner. Will was speaking to Matt Stocks.